A mix of carrots, parsnips, red onion and potatoes washed and ready to roast. 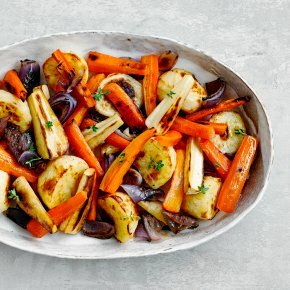 To enjoy your vegetable sides at their best on Christmas Day, we recommend adding them to a delivery slot for 23 or 24 December. INGREDIENTS: POTATOES (40%) (preservative (sodium metabisulphite)), carrot (30%), red onion (16%), PARSNIPS (14%) (preservative (sodium metabisulphite)).